I just received my new Extra Bases credit card. 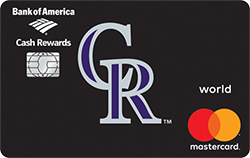 I’m an avid fan of the Rockies and was kindly reassured that the card would reflect that of the Rockies as shown on your web-site. When I received my card, it didn’t show what was promised. I called to activate the card and was told by a nice agent that they no longer do the individual teams on cards. She checked with her manager and he said the same. I know this is petty but why does your web-page lead you to the impression that you’ll receive the card that’s shown? Very misleading to say the least. I’ll change the card image to a the generic MLB one. Meanwhile the OFFICIAL MLB Extra Bases web site still features cards with the individual team pictures, i.e. a Rockies card. On the Help Desk page question 20 specifically reads: Q: What can I do if I received my new MLB Extra Bases credit card with the wrong team logo? A: For this and all MLB Extra Bases credit card account questions, please contact Bank of America Customer Satisfaction department at 1-800-421-2110 for assistance. No where on the official MLB Extra Bases web site does it say individual team cards have been discontinued, matter-of-fact the official site still promotes them. Thanks for the heads up, so I can be be more accurate than MLB is itself. Let me know if you find any more errors, as fans deserve to get their money’s worth. By the way, in my opinion, I hate it when a player jogs to first on a routine out. Fans play a lot of money to support their team, and players should give 150% effort on each and every play: no matter how ordinary.